This famous Italian-American pasta will rock your world! 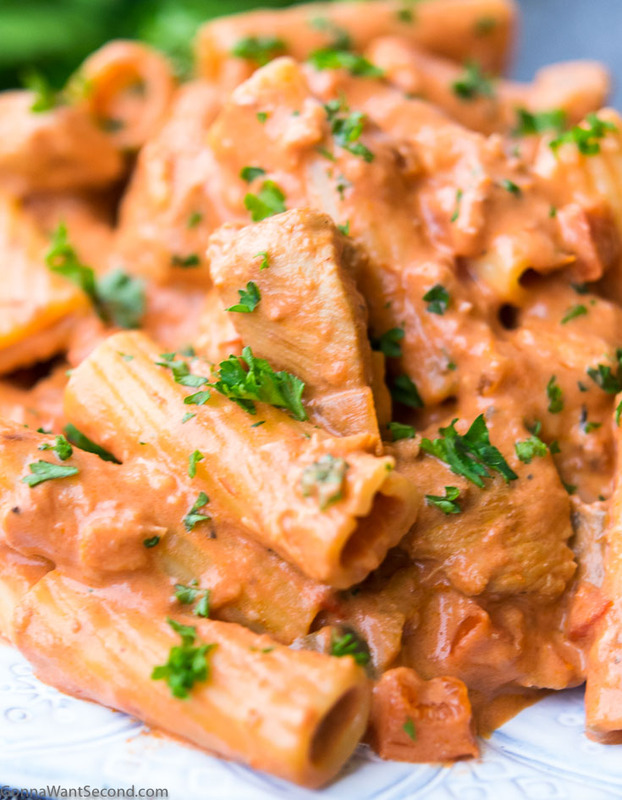 In Chicken Riggies, a thick tomato cream sauce smothers marinated chicken and veggie-rich rigatoni. Chicken Riggies is the creation of upstate New York Italian immigrants, and it’s still quite popular in the area today. As with any great dish, experts create their own unique cooking variations. The base ingredients in this recipe are pretty constant, Mr Food Utica Chicken Riggies recipe is a good example. 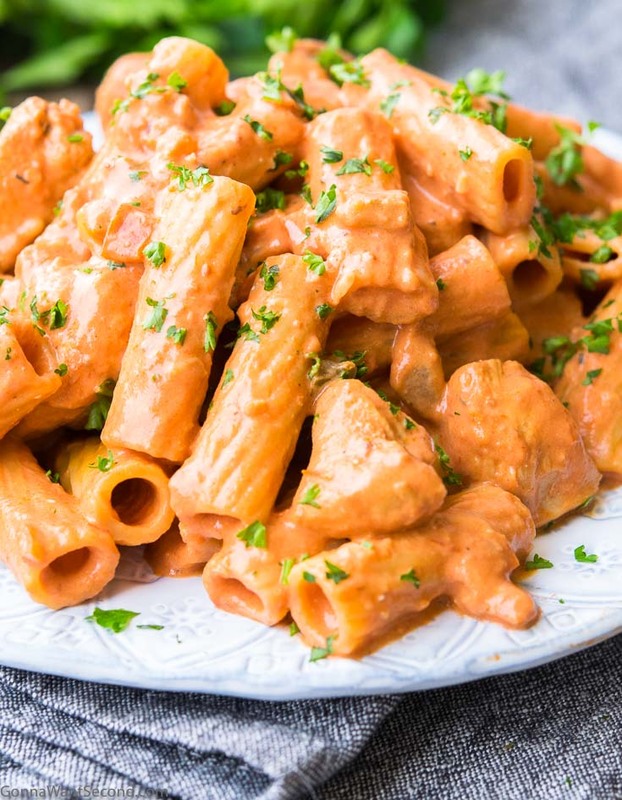 The main elements are al dente rigatoni pasta, several varieties of chopped peppers, dry sherry and Italian seasoning marinated chicken, and a rich creamy tomato sauce. Is your mouth watering yet? I know mine is! 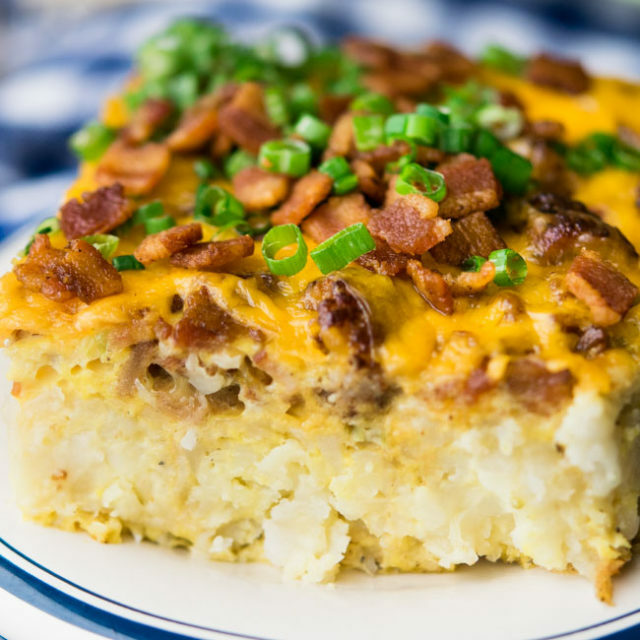 If this Utican dish has you in the mood for more East Coast fare, try Chicken Murphy, a Jersey Shore classic, or Chicken Scarpariello, another regional favorite! The creamy tomato sauce is unparalleled. I love a good mix of al dente pasta and sautéed veggies! The marinade gives the chicken delicious Italian and garlic overtones. It fills my house with wonderful smells! 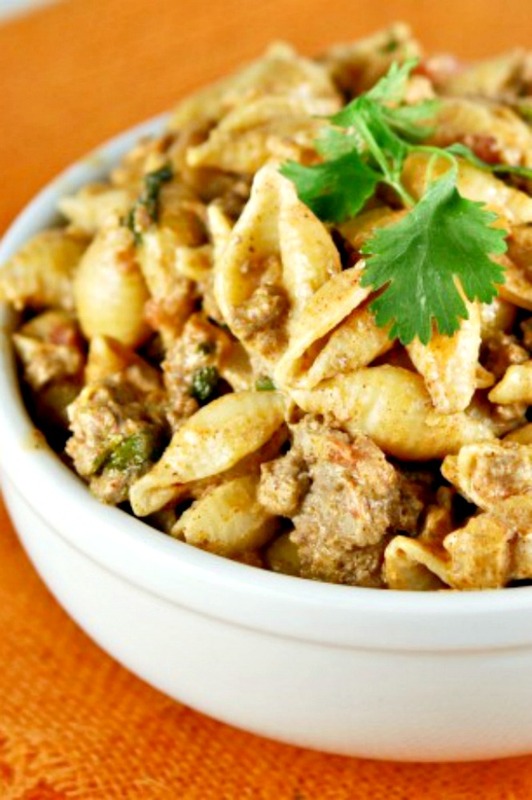 You won’t be counting chicken riggies calories when you’re halfway through this amazing Italian-American pasta! 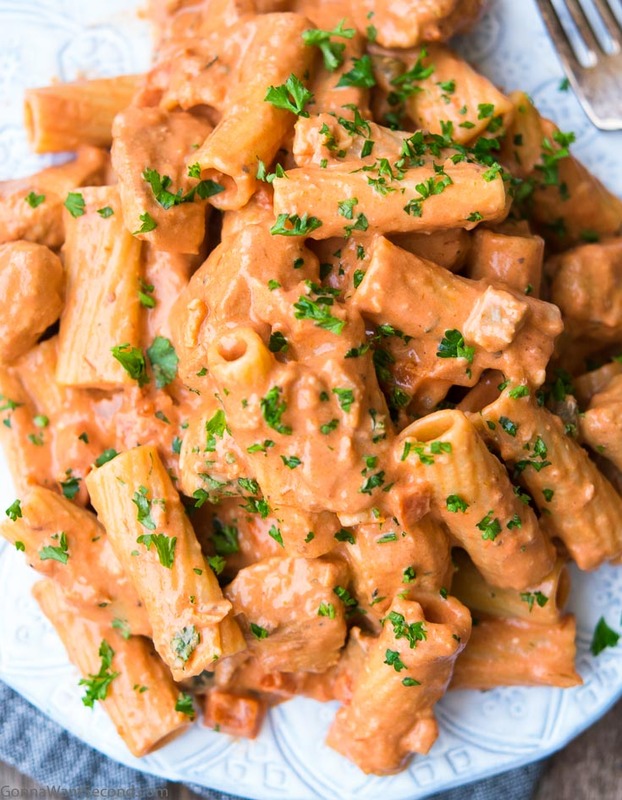 Its primary components are chicken, rigatoni, and peppers, smothered in a creamy tomato sauce. No one knows the exact origin story of the dish, but it was likely born in Utica, New York’s Sicilian immigrant community in the 1900’s. 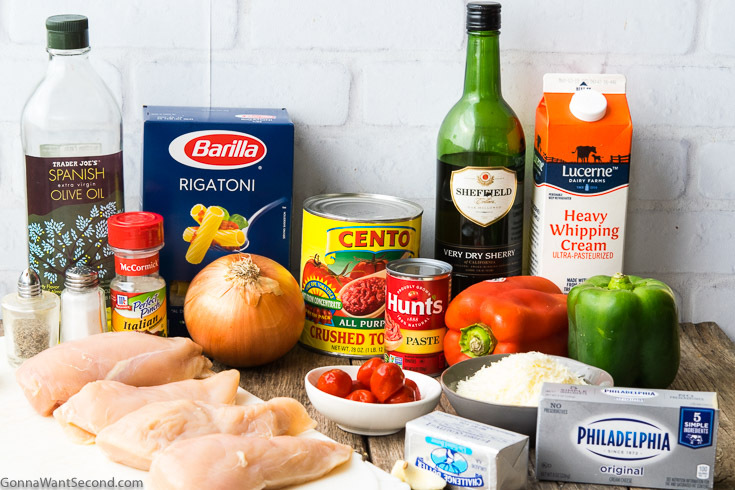 What Ingredients Do You Need To Make Chicken Riggies? 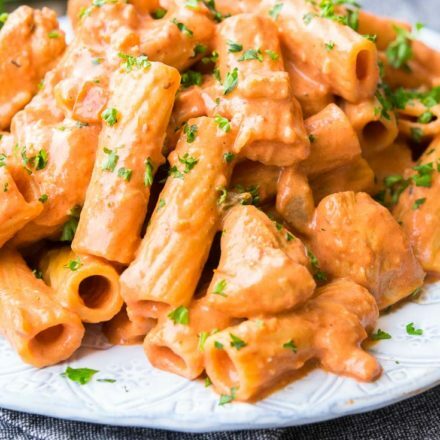 Some people make simple buffalo chicken riggies, but I prefer my version of the sauce for its creaminess and complexity! My sauce calls for butter, dry sherry (not to be confused with “dried sherry,” which doesn’t exist! ), tomato paste, crushed tomatoes, salt, black pepper, heavy cream, cream cheese, and parmesan cheese. 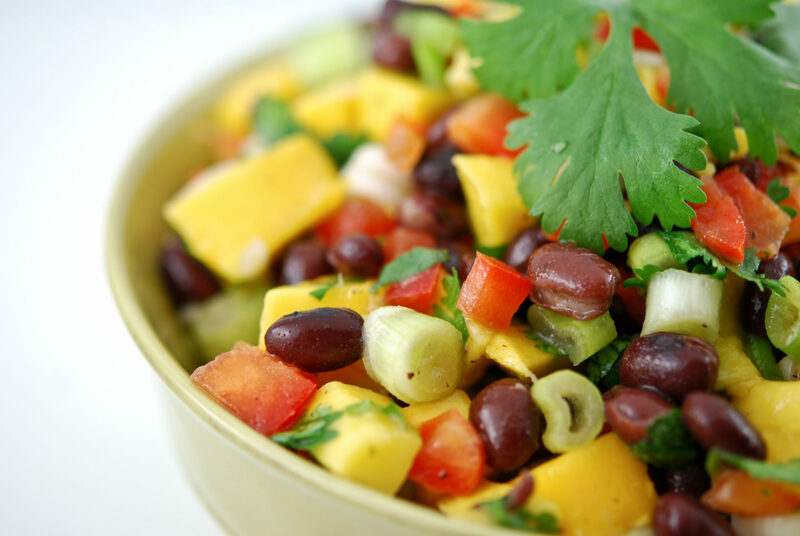 It also contains a healthy quantity of veggies: diced red bell pepper, diced green bell pepper, chopped hot cherry peppers, diced yellow onion, and minced garlic. You will also need 16 oz. of rigatoni. This recipe sure beats plain old chicken riggies with jar sauce! 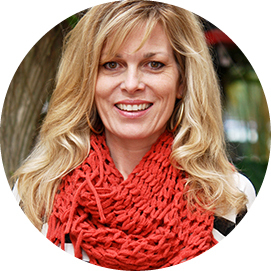 How Do You Make Chicken Riggies? Just marinate and cook the chicken, sauté the veggies, boil the sauce (in two stages, one for the tomato base and one for the cream), and add the cooked pasta. It’s as straightforward as that! Get ready for a taste of ol‘ Italy (Americanized)! 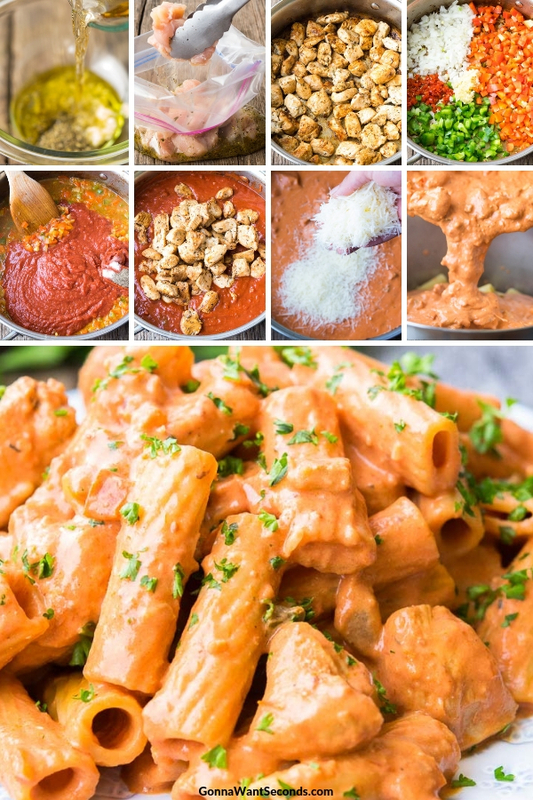 I hope this chicken riggies recipe has you and your family laughing and singing Sinatra songs at the table! Combine sherry, 2 Tablespoons olive oil, minced garlic and Italian seasoning in a 1-gallon resealable plastic bag. Add chicken and seal bag, removing as much air as possible. Place bag on a rimmed baking sheet (to catch any possible leaks) and refrigerate 60 minutes. Heat remaining 2 Tablespoons olive oil in a large pot. Cook chicken, in batches, over medium-high heat until there is no longer any pink. Remove cooked chicken to a plate and set aside. In the same pot, melt the butter. Saute red bell pepper, green bell pepper, cherry peppers, onion, and garlic over low heat until soft, about 7-10 minutes. Pour 1 cup sherry to the pot and bring to a boil. Add tomato paste, crushed tomatoes, salt, and pepper and bring back to a boil. 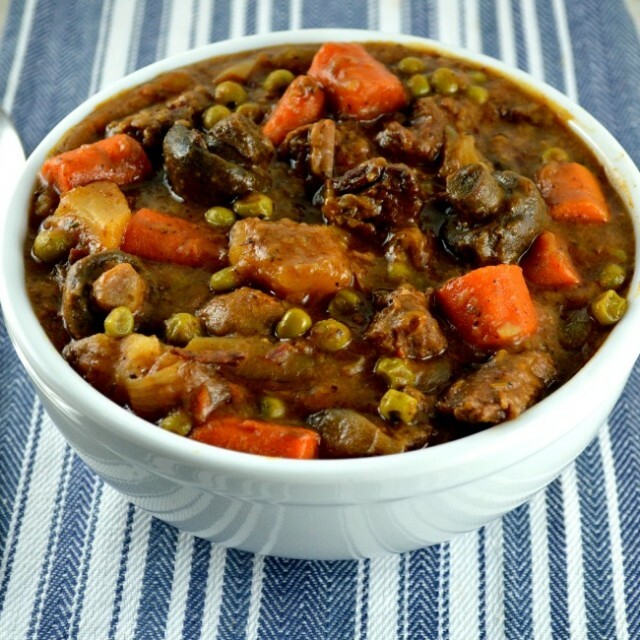 Reduce heat and simmer 8-10 minutes until mixture thickens slightly. Add chicken to mixture. Meanwhile, cook the rigatoni to al dente in a separate pot according to the package instructions. 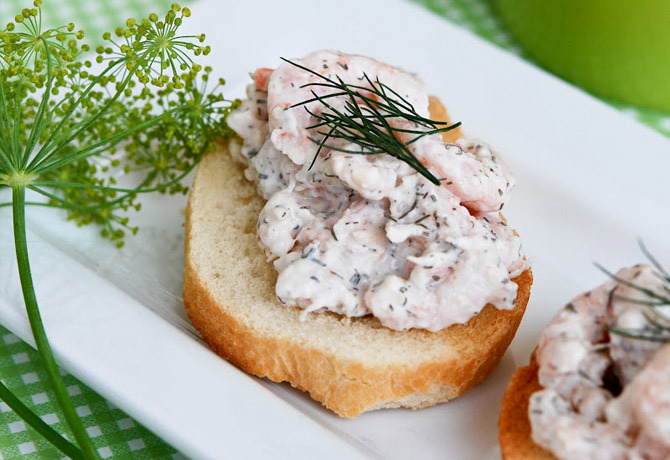 Combine cream and cream cheese in a small saucepan and cook over medium heat until the cream and cream cheese and well combined and the cream cheese has melted. Pour into the chicken mixture. Stir in Parmesan. How To Make Chicken Riggies Ahead Of Time : For a chicken riggies Rachael Ray would admire, don’t prepare the pasta until you are ready to serve! The rest of the dish will keep in the fridge for about three days. Just reheat on the stove when the time comes, boiling the pasta separately. 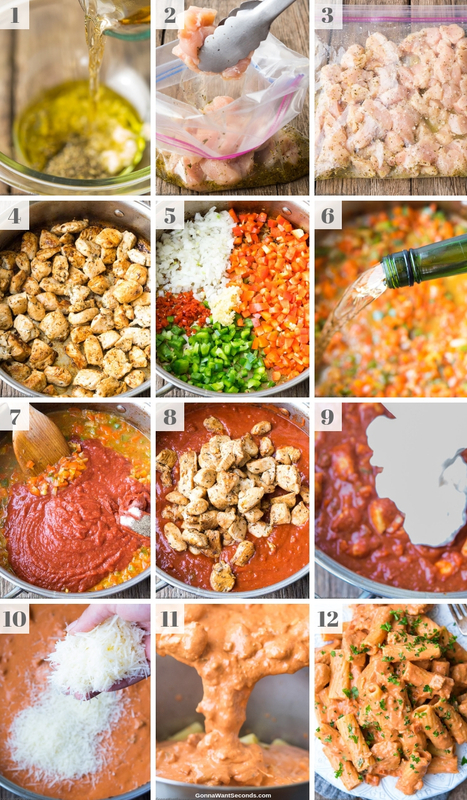 How To Freeze Chicken Riggies : For a chicken riggies Chef John would smile upon, freeze in an airtight container for up to 2 – 3 months. For best results, freeze without the pasta and prepare a fresh batch when the serving time comes! What To Serve With Chicken Riggies: Chicken riggies goes great with a simple Italian side salad, steamed broccoli, or lemony green beans. 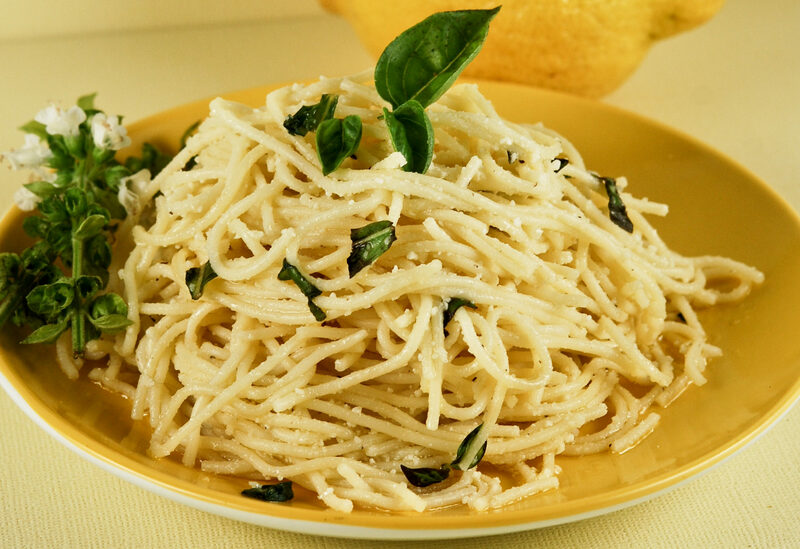 You will want something light and fresh to pair with this heavy pasta dish!